Predictable performance at elevated cutting speeds. SANDVIK Coromant has released a range of cubic boron nitride (CBN) inserts for generating optimum surface finish quality in case-hardened steels. The CB7015 inserts provides predictable performance at elevated cutting speeds from continuous to light interrupted finishing operations. The Safe-Lok multi-corner technology consists of a mechanically-interlocked CBN corner brazed away from the hot cutting zone, providing strength and security. 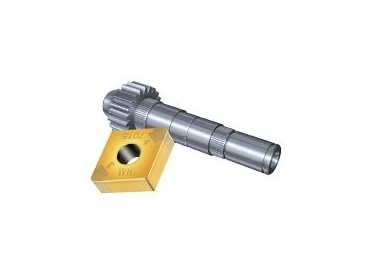 The large CBN cutting edge is useful for machining up to shoulders, undercuts and in other profiling operations.